In just a few short days, The Man Without Fear will return to the small screen, with the debut of Daredevil Season 2 on Netflix. 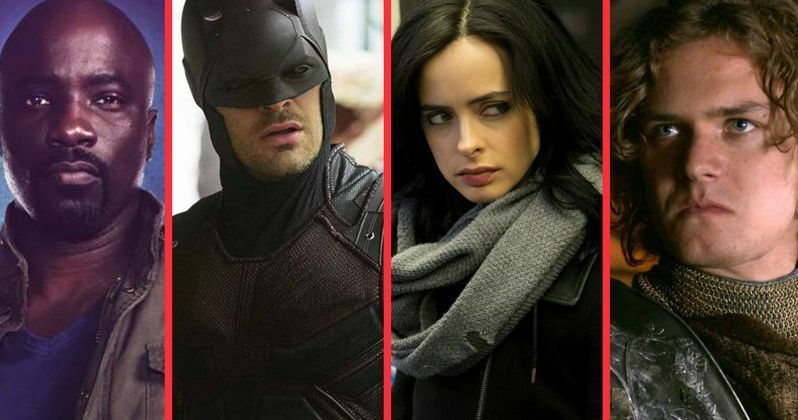 Daredevil was the first of four Marvel shows to launch on the streaming service, followed by Jessica Jones in November, and Luke Cage recently confirmed to premiere in September. While we still don't know when the fourth show, Iron Fist, will debut, all four of these Hell's Kitchen heroes will eventually unite for the miniseries The Defenders, which will likely arrive sometime in 2017. Entertainment Weekly recently caught up with Daredevil star Charlie Cox, who teased how this new season helps tie into The Defenders. When all four shows were announced back in late 2013, Netflix was planning to debut all four shows in 2015. But that didn't happen. Jessica Jones was recently renewed for a second season on Netflix in January, and if Luke Cage and Iron Fist are successful, those shows will certainly be renewed as well. Still, if all of these shows are picked up, it remains to be seen when all of the stars will be able to find time for The Defenders miniseries. Though it seems that Charlie Cox's Matt Murdock will start to learn some valuable lessons about teamwork in Daredevil Season 2, which ties into The Defenders. "Does what happen to Matt his season somehow prepare him for what is coming, which is what will eventually be The Defenders? I think quite possibly, but I don't think he has any knowledge of that. I don't think that he could even fathom that that is a possibility. Something that's very tricky for Matt is to allow anyone to help him. He finds it impossible to ask for help, for a number of reasons. One is he doesn't want to endanger anyone he loves, but also because he has an arrogance. He has a self-confidence and a belief, and I think, at times, a belief in his own invincibility, which is false. It's very stubborn at times and very deluded at times. One of the lessons that he's going to have to learn this season is that he needs other people, he needs help, we all need help. Hopefully, that will therefore mentally prepare him for what's coming. I don't know what the dynamic of The Defenders will be, but if it will be a team-up, he'll have to learn those lessons in Season 2." Even with just two days left until the season debuts, there's still so much we don't know about the second season, although we do know that two iconic characters will be introduced. Jon Bernthal stars as Frank Castle, a.k.a. The Punisher, with Elodie Yung also coming aboard to portray Matt Murdock's (Charlie Cox) new love interest, Elektra Nachios. The hit series is also bringing back Season 1 favorites such as Deborah Ann Woll (Karen Page), Elden Henson (Foggy Nelson), Rosario Dawson (Claire Temple) and Scott Glenn (Stick). In related news, we also have a final trailer for Season 2 of Daredevil, along with a preview that teases the battle between Matt Murdock and Frank Castle, a.k.a. The Punisher. Do you think these potential "teamwork" lessons Matt needs to learn could be taught by The Punisher himself? We'll find out for sure in just a few short days, but until then, take a look at the new videos below for Netflix's Daredevil.